Rehanna MacDonald and Adam Kashmiry in Adam. Photo: Eoin Carey. Adam moves from woman to man, Egyptian to Scottish, refugee to citizen: reborn into a new body and a new life in a new place, he finally meets the woman who will become his wife when he musters the courage to tell his story. For most of the play, the character of Adam is performed by both Kashmiry (“Glasgow Adam”) and MacDonald (“Egyptian Adam”), literalizing the inherent duality of Adam’s existence up to full transition: As a child in Egypt, called “princess” by his mother but always feeling wrong in a girl’s body. As an adolescent, feeling powerful as an athlete but undercut by the female body that begins to menstruate. As a young woman, working in a clothing store and beginning a tentative romance with a co-worker, Amira, which founders when he realizes she sees him as a lesbian like herself. Being thrown out by his father when the father catches him sneaking home late in men’s clothing. Trapped in asylum-seeker’s purgatory in Scotland, losing appeal after appeal because he can’t prove he’s transgender. As the movements of the Arab Spring rise and then collapse while Adam is still trapped in limbo, Egyptian Adam grows more and more desperate, wanting to return home, wanting to give up. (As with the asylum story, there’s another whole buried story here about political and personal transformation, about the desire to return home to a changed nation as a changed person, and about the relationship of exiles to the collapse of the Arab Spring’s possibilities.) But after he begins taking testosterone (at first acquired from the internet), and Egyptian Adam comes to the breaking point, Glasgow Adam is fully born. MacDonald disappears and only Kashmiry remains. There is some sadness in saying goodbye forever to his past, but more joy in embracing his finally realized self. In a program essay, J de Leon writes, “Transition begins in language…. Our names and pronouns are spoken into the world to give it a new shape.” And in Poet’s conception, Adam is fascinated with the hidden dualities in language: the gendering of nouns and forms of direct address in Arabic versus their neutrality in English; the existence of contranyms, words that mean two opposite things–”sanction,” which means both to permit and to penalize, for example. It’s fitting, then, that Adam’s critical turning point (and also one of the play’s most unique features) comes through a question spoken into a void: posting on the Internet whether it’s possible to be a man trapped in a woman’s body, and in return receiving a flood of recognition and validation, “affirmative repetition” in de Leon’s words. 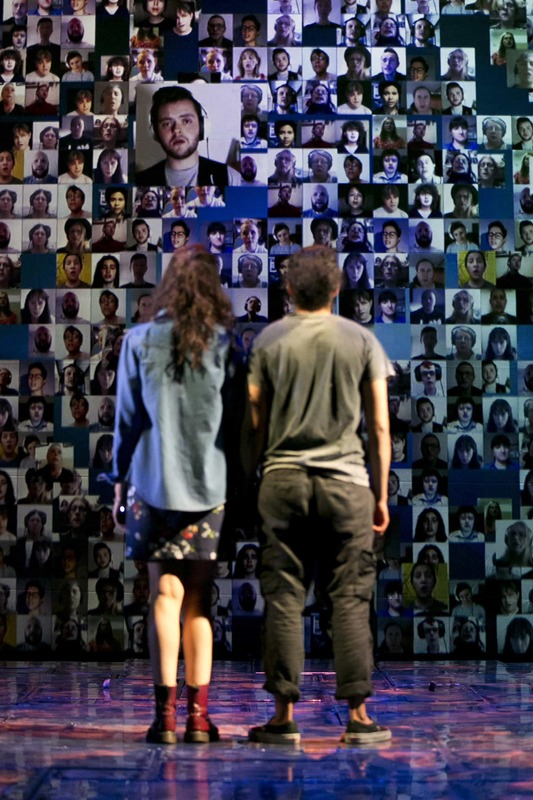 Adam represents this as what the play calls a “virtual choir”: transgender and nonbinary people from around the world, projected telling their stories and then singing an oratorio of identity and recognition (the music is by Jocelyn Pook). It’s chillingly beautiful and a little hokey all at once, but it lights a spark in Adam: the possibility of being seen and being able to live a single, whole life. The choir doesn’t feel fully integrated into the play-world, though; the score, even if the images and stories of the singers only appeared once, could be more woven throughout. While Kashmiry’s story is affirming, ultimately triumphant, and even romantic, the play, directed by Cora Bissett for the National Theatre of Scotland, sometimes has a harder time finding a way to theatricalize that story. While Emily James’s clever set, an inclined plane full of hidden elements and a giant projection wall is striking, especially the rim of mannequin parts encircling the playing plane, it sometimes feels overly fussy, transforming the space merely for the sake of marking a transition. Bissett brings almost unbearable tension into the section where Adam is trapped in a small Glasgow bedsit, which centers around a narrow uncomfortable bed, while awaiting judgment on his asylum case, and it’s more effective than the more physicalized other areas, as cleverly designed as they are. MacDonald and Kashmiry play all the other roles in the piece as well: Kashmiry’s mother and father; his co-worker/never-quite-girlfriend, Amira; asylum court representatives and doctors in Glasgow. I wasn’t always positive I understood the logic behind which actor embodied Adam in each scene, other than a desire to, for the most part, portray cisgender characters with an actor of matching gender (so MacDonald plays Adam’s mother to Kashmiry’s Adam, and vice versa for his father). This is Kashmiry’s professional stage debut, and as such, he’s also not as fluid shifting between Adam and other characters as MacDonald is. The piece does to a certain extent take place inside Adam’s mind and memory, but I still found myself wondering at times whether a third actor would allow the dual consciousness of Adam to be more present throughout, rather than only in the dialogues Adam is having with himself. De Leon writes that gender “relies on an audience that either affirms and repeats–or refuses–one’s desire to be seen and understood in a way that breaks with expectation.” Adam calls upon theatergoers to be that audience for Adam Kashmiry. As affirmation and as autobiography, the piece is satisfying and even inspiring. As a larger piece of theatre, it didn’t entirely succeed for me.